*This is a physical gift card and will be shipped to the address listed in your Swagbucks account. Make sure the address is correct as we cannot ship out replacement gas cards. Chevron gift cards are valid at over 8,000 Chevron and Texaco branded locations in the United States and may be used to purchase authorized goods and services. Chevron U.S.A. Inc., including its affiliates and divisions, is not a sponsor or co-sponsor of this promotion and is not affiliated with Swagbucks. See terms and conditions at www.svmcards.com. All rights reserved. 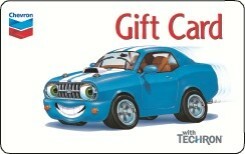 Note: This is a physical Gift Card and will be mailed to the shipping address associated with your Swagbucks account. Under no circumstances will this Gift Card be mailed to a different address. To update your shipping address, go to "My Settings" and click the edit tab located next to Shipping Information.